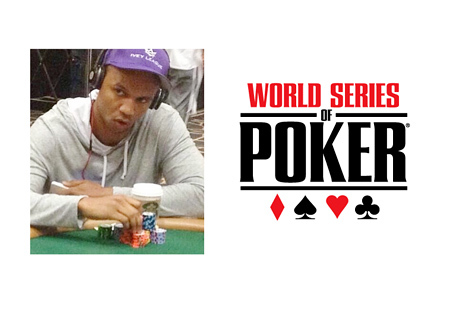 Despite the fact that Day 2c still has two levels left to play, Phil Ivey is one of the tournament's chip leaders. The remaining Day 2c participants just went on their 90 minute dinner break. A very familiar name sits at the top of the Day 2C leaderboard, as Phil Ivey currently lords over a stack of 421,000 chips. Playing against Phil Ivey is intimidating enough, but playing against him when he has a large stack is enough to send many players into fits. Ivey's big hand of the day came when he got all-in after the flop with two other players. Ivey had flopped bottom set, while one of his opponents had the nut straight while the other had an overpair. The person with the nut straight knew that he would be going out the door, which led him to stand up before the turn and river had even been dealt. Ivey was incredulous, but he ended up making a full house on the river to send his two opponents out the door. Ivey has been using his big stack well and has chipped up throughout the day. There are some other notable players who make a big deal of showing up late to the first day of play at the World Series of Poker main event, but Phil Ivey has always shown up for the first hand of play. This year was no different, despite the fact that he already won his much-publicized World Series of Poker bracelet bet. Phil Ivey seems laser-focused on making a deep run in this year's WSOP main event, and that's bad news for all of the opponents at his table.